One of interior designer Jenny Adams’ recent favorite projects is her own home. Jenny, a designer at G&G Interiors, and John, a commercial real estate broker, met at UT through Young Life and married in 2003. The family now includes John IV “J” (12), Addalee (10), Cole (7) and a four-year old boy they’re adopting. They moved from Forest Brook to their current home in 2013. Removing an exterior door made possible the mudroom, which includes a water fountain. They also turned the dining room into a music room. “We don’t need a [formal] dining room in our phase of life,” said Jenny. 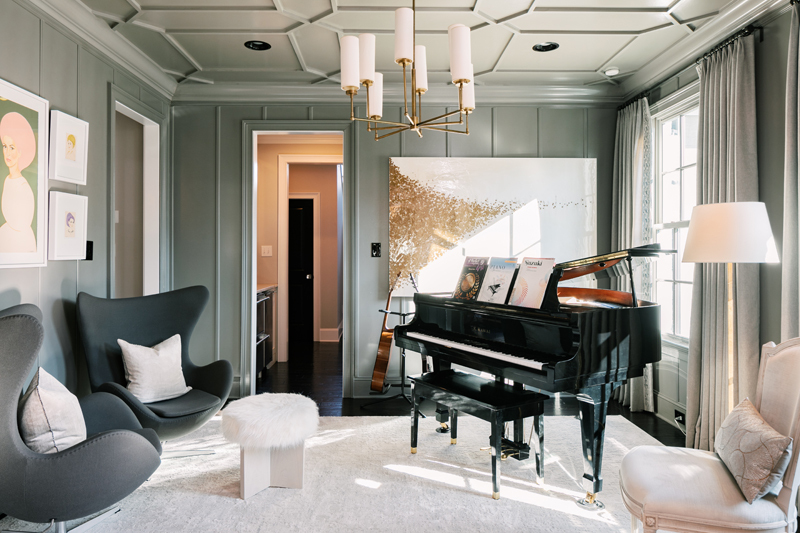 “We needed a place for the piano.” “The egg chairs, an Arne Jacobsen design I loved for 15 years before I bought them, started out in the living room,” she continued. “When we moved them to the music room, it opened up the living room and increased the seating in the music room, so, it turns out, we use both rooms more.” The Adams created an informal dining area adjacent the kitchen. The glass-topped “liquid dining table” with curved metal legs and Louis XVI acrylic ghost chairs are all easily cleaned. The white kitchen has a large island with a one-basin sink; there are double ovens and two full-size dishwashers. In the living room, Jenny combined traditional sofas with contemporary coffee table and lamps. For draperies and pillows, Jenny turned to a famous floral fabric, Pyne Hollyhock, which was reintroduced by Schumacher in 2010 and named after legendary socialite tastemaker Nancy Pyne who worked with Albert Hadley in the 1960s to create one of the most iconic rooms in the annals of decorating according to Jenny. “J wanted me to paint his bedroom UT Orange,” said Jenny, “but I said ‘You do not want to wake up having that color assault you every morning.’ He had lots of input. We compromised with touches of orange.